Naming a hotel Eden, is an ambitious thing to do. Eden Andalou Spa & Resort did, however, meet our expectations to the fullest. Behind high walls you found an Andalusian Style Palace set in a beautiful garden run by a staff that did their utmost to give you a great hotel experience. Staying at Eden Andalou Spa & Resort was one of the best hotel experiences for years. 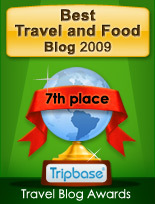 But this is not the hotel to choose if you want to stay within easy reach of the city area. 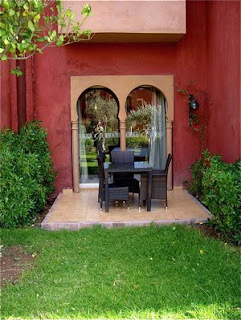 Eden Andalou Spa & Resort is located by Route d' Azmezis, 9 kilometers from the city of Marrakech. Here you find a landscape of partly semi desert with hardy shrubbery and partly agricultural land. 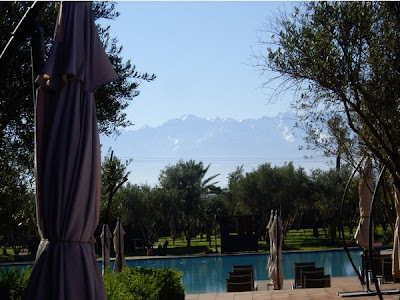 In the distance you can see the snow capped peaks of the High Atlas rising over 12000 feet over the valley below. Eden Andalou Spa & Resort is located in a secure area, beautifully planted with orange grows, olive trees, palm trees and other exotic plants. I will highly praise the staff at Eden Andalou Spa & Resort. I have rarely felt so welcome at arrival and we were taken care of by a professional and kind staff at the reception, restaurants and bars. We left a small contribution for the staff tidying our room and we were both spoilt rotten by them. We would like to strongly commend the staff at Eden Andalou Spa & Resort for their excellent service during our stay. All rooms at Eden Andalou Spa & Resort were suites, starting from 40 square meters in size. We had booked a junior suite, and were on arrival upgraded to a junior suite with our own terrace. Room 166 had two separate beds, separate room with two comfortable sofas, a large bathroom with two sinks, separate shower and bathtub and a separate toilet room. Room 166 had a small terrace with modern garden furniture facing both outdoor swimming pools, and the beautiful inner garden. 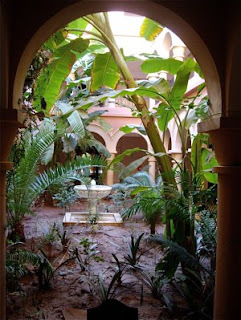 The beds were very comfortable and we had duvets, keeping us warm through the cool Moroccan nights. The room had a contemporary decor with many traditional features. It was painted in cream and white colours with beautifully detailed trims. Floors were covered in ceramic tiles. Dark wooden furniture matched the colour scheme. Beautifully tiled bathroom with shower with glass door, and separate bathtub. Tops in polished sand coloured marble. Generous amount of storage available. All was immaculately maintained, not a scratch or a crack in sight and very well cleaned. Breakfast was was included in the price and served at Restaurant le Toque by the inner yard and swimming pool. The buffet at Eden Andalou Spa & Resort had a generous variety of different products and could easily satisfy the most demanding guest. As Morocco is a Muslim country there were no bacon available, but I tucked into the most delicious spicy sausages, an excellent substitute. The other hot dish available on the buffet table was, funny enough, dauphinoise potatoes - not the most obvious choice for my breakfast. Another great option was that you could order delicious omelets with vegetables outside the restaurant. The cook could prepare a plain omelet, but you could choose onion, tomatoes, ham (halal), and cheese - and I ended up ordering the full package every day. There were a wide variety of croissants, other pastries, breads, and even small pancakes served with melted butter. There was a selection of cheeses, boiled ham (halal), fresh tomatoes, cereals and different jams and honey. Health conscious guests may choose from a wide variety of fresh or dried fruits, cereals, and yogurts. Very good teas, coffee, chocolate. Peach, pineapple, and freshly pressed orange juice (YUM!!!!). Entertainment: Three inhouse bars and three restaurants. Be prepared that there may be fewer restaurants open during winter. 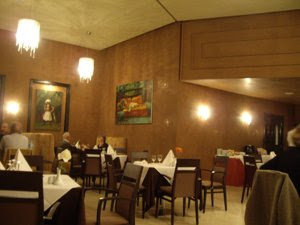 During our stay we could take a drink in Jazz bar, and dine at Restaurant Le Toque and Le Fes. Exercise:Indoor swimming pool (in spa area - free during our stay, a fee may be charged), two outdoor pools, one heated to 30 degrees, the other temperated. Exercise-room, different spa treatments, and Hammam (Turkish Bath) available at fixed price list. Well being: Air conditioning, room service, several large outdoor and indoor rest areas, a few with open fire place. Roof top terrace with bar. Large garden, entertainment centre for kids. Others: Wireless internet access available, but very expensive (60 dirhams - 5,35 EUR per hour, 200 dirhams - 17,80 EURfor 24 hours). 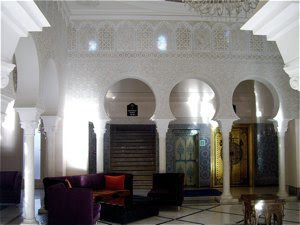 Free shuttle service from hotel to Place Foucauld in Marrakech 6 times a day (first 9.30 AM from hotel, last 11 PM from Marrakech. Maintenance: Newly built - immaculately cleaned and maintained. We paid 4500 NOK (552 EUR) per person for flight and 7 nights at Eden Andalou Spa & Resort. That was a real bargain. Be aware that you may easily charge dinners on you room, without being robbed blind. Room service is free (except for the tip for the waiter). 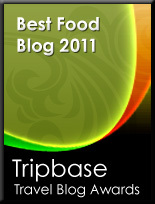 We paid 1500 NOK / 185 EUR per person for 7 dinners with 1/2 bottle of wine!!! Professionally run Resort and Spa Hotel at an unbeatable price. One of my best hotel experiences for years. Several restaurants and bars, pools and beautiful garden - a true garden of Eden. 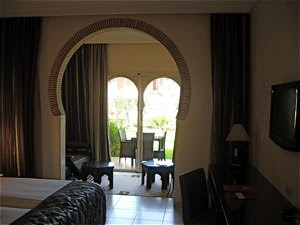 Only downside was the location, as it is located 9 km from Marrakech city centre. 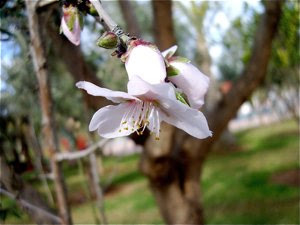 This may, however, be an advantage as well. Marrakech is a very chaotic and noisy place to be, and we found, thanks to the free shuttle service, a happy retreat to the secluded location a bliss after a long day in the city.